office mascot, Millie the dog), Elizabeth Davis, Rebecca Hansen. Founder and Managing Director, Elizabeth Davis is an internationally recognized and published expert in the field of inclusive emergency management. She combines her passion for emergency management and disability rights and advocacy to implement change in policies and practice to ensure greater safety for all. For more than 15 years, she has brought this passion, dedication, experience, and accomplishments to her work. Ms. Davis founded EAD & Associates, LLC in the summer of 2001 to create an emergency management consultancy with a holistic client-centric approach to providing quality real-world solutions. With a unique expertise and focus on emergency issues of populations with functional and access needs, the EAD & Associates, LLC (EAD) team is a proven leader in the field of emergency management. The EAD team that Ms. Davis brings together is a group of people who, like herself, are dedicated and passionate about making an impact on emergency management to improve the safety and lives of ALL individuals. The team includes a diverse group of people representing multi-disciplinary backgrounds, who work together to bring expertise, skills, and practical solutions to clients serving populations all over the world. 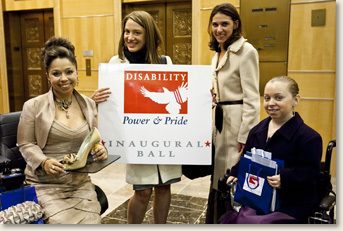 Kelly Rouba (far right), of EAD, at the Disability Power and Pride Inaugural Ball in Washington, DC. Ms. Rouba was a member of the Ball's Event Media Committee along with Juliette Rizzo (far left), Director of Exhibits & Event Planning for the Dept. of Education, and Kendra Kojcsich, of Porter Novelli. Pictured second from the right is Jordan Silver, founder of Ag Apparel, an accessible clothing line. In addition to the skills and leadership of Elizabeth Davis, EAD & Associates, LLC clients have access to some of the most experienced and knowledgeable experts in the fields of emergency management and special needs planning. The EAD Team is made up of core and associate members. 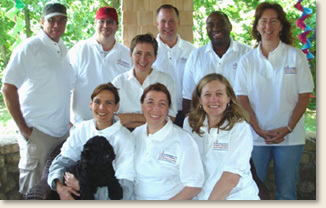 The company's core and associate team members have decades combined experience in public and private sector police, fire, security, and human services policy and management and are pre-eminent specialists in emergency management and special needs planning, response, implementation, and administrative oversight. The core members are dedicated employees of the firm and associate members are individuals who contribute regularly as project managers or participants. The core team is based in Brooklyn, New York and associate members are located throughout the United States and Canada. We are committed to the practice of creative problem solving. We are dedicated to acquiring and sharing essential wisdom. We believe our credibility and integrity is a key element of our success. We see ourselves as advocates for the client with the client. We are devoted to empowering communities and individuals. 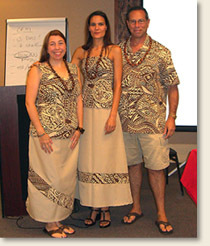 We support pro bono projects that assist organizations and communities. Bruce Brodoff, Levester Burnley, Georgeanne Cherry, Alan Clive, Raymond P. Czwakiel, Christy Gibney, Lisa Gibney, Zachary Goldfarb, Max Green, Annie Grunewald, Nancy Hansen, Edwina Juillet, Marianna Leckner, Sal Lifrieri, Bruce McFarland, Jennifer Mincin, John Muller, Jack Murphy, Hal Newman, Anthony Ng, Rose Pandozy, Luis Penalver, Brenda Phillips, Rebecca Rabin, Kelly Rouba, JoAnn Scordino, Matthew Shields, Michael Weston, and Dave Zuckerman. "Elizabeth Davis is to the field of emergency preparedness what Kleenex is to tissue and Band-Aid is to an adhesive strip. Within the industry of emergency management for persons with disabilities, Ms. Davis is a household name." Kelly Rouba, of EAD, after receiving an award for her advocacy from the Catastrophic Illness in Children Relief Fund Commission. 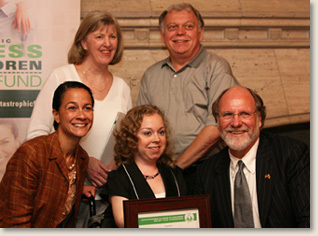 On the right of Ms. Rouba is Governor Jon Corzine, of NJ, and on the left is Jennifer Velez, Commissioner of the NJ Dept. of Human Services. Standing are Ms. Rouba's parents Kerry and Frank.